This beautiful, 2-story, 4 Bedroom 3 bath home sleeps 10, is pet-friendly and is equipped with all of the comforts of home. Street view of Sea Rae Side view of front with ocean view Entryway Front inside entry Beautiful modern kitchen. Granite topped kitchen bar. Cozy living room with gas fireplace. Side bar in living room, equipped with sound system. Large dining table for nights in. Downstairs bed room with naturally lite reading nook. Upstairs reading nook with great natural lighting. Full bath room downstairs. Spacious laundry room. Staircase Master bedroom with king bed. Master bedroom with king bed. Upstairs bathroom with walk in shower Closet comes stocked full of children toys. Spacious bunk room with room for indoor activities DVD and VHS collection and players in bunk room for your enjoyment. Master bathroom upstairs with walk in shower Upstairs bed room with reading nook. Outdoor shower for after a a fun day in the sand. Private patio in back yard. Beautiful view from front patio, right up the street from the beach. The City of Cannon Beach limits us to one guest rental every 14 days, so SeaRae has limited check-in and check-out dates. You may use the online booking function to make a reservation, or please call the CBVR Office at (503) 436-0940 if there are questions. Thank you! Looking to ponder the mysteries of the ocean? Come for a stay at Sea Rae, and let this fine home whisper to you all the secrets of the sea! Located in the heart of Tolovana Park, this newer four bedroom, three bathroom hideaway comes fully equipped with all the amenities and comforts you'll need to entertain in high coastal style. On the main floor, a spacious open plan with lots of windows lends a warm, inviting atmosphere with lots of space to nestle in and spread out. Get creative with your cooking in the modern kitchen, which offers a roomy granite countertop island with bar stools plus stainless steel appliances and an enormous oval shaped dining table that seats 10. The nearby living room offers a wet bar and lots of comfortable, high quality furniture, arranged around a beautiful gas fireplace with a large flat-screen TV set just above. Stereo surround-sound and WiFi make this a great spot for a little low key group relaxation time at day's end. Downstairs, you'll also find a bedroom with a queen sized bed, full bathroom with tub/shower combo, and a laundry area. The living areas of this beautiful main floor aren't limited to the indoors, however; you'll have access to a large south facing deck right off the living room, while a second north facing deck comes complete with an outdoor shower, perfect for hosing off after a busy day of beachcombing. Upstairs, you'll find more peaceful places to drop off to sleep: there's a lovely master bedroom with a king sized bed right next to a full bathroom with step in shower, plus a second bedroom on this floor with another plush king sized mattress to drift off to dreamland on. Down the hall you'll discover a spacious, kid friendly bedroom with two bunk beds and a pyramid bunk. The outdoor area also includes a fully fenced yard plus room for parking 4 cars. Sea Rae is located just four houses away from the ocean, which means you'll be serenaded by the roar of the surf from indoors while enjoying easy beach access from outdoors. A bakery, market and a few popular local restaurants are also on hand right nearby. Listen carefully: this beautiful coastal hideaway has all sorts of wonderful secrets to share. 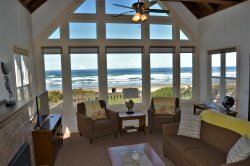 Cannon Beach Vacation Rentals also offers these nearby homes: Sea Breeze, Bella Vista, and Robar's. It was absolutely PERFECT! Best people I have ever dealt with, would recommend you guys to EVERYONE!!!! Thank you so much, you guys blessed me and my family, merry Christmas!! Very good service and an enjoyable stay! Great experience, really enjoyed the visit. We are never disappointed when we come. Wonderful, the staff were very friendly and accommodating. The home couldn't have been more perfect! Was pleasantly surprised at the.upkeep and cleanliness of the property. And that it was well stocked with paper products, towels, soap. The kitchen and appliances were great; could of used more wine glasses. Positive experience. Easy to use for our first attempt at renting house. Dog friendly location and property. We had a wonderful time. Can on beach is always a great vacation spot and we found a wonderful home to accommodate our family. The company was great to deal with. We will contact them for our next visit. All in all we had a spectacular visit--it is beautiful and you took very good care of us! Regarding Availability--Please call the CBVR Office (866) 436-0940 to confirm calendar availability of SeaRae.